Helen Tangires. Movable Markets: Food Wholesaling in the Twentieth-Century City. Johns Hopkins Press, 2019. Why did Paris destroy Les Halles? Why did New York City move the Fulton Fish Market to the Bronx? People who remember these places still mourn their loss. This book explains why such moves were inevitable. They happened as a result of concerns about sanitation and crowding, the introduction of trucks, the need for parking, and the high cost of inner city real estate, and that’s just for starters. 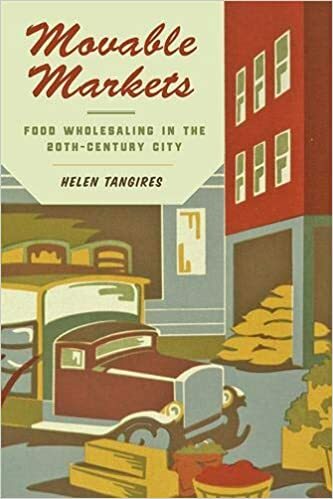 In investigating the social, economic, and political forces behind the removal of beloved city food markets—Les Halles in Paris, New York’s Washington Market, for example—to more efficient but far less colorful out-of-town locations, Helen Tangires has given us a refreshingly new take on the history of twentieth-century food systems. Anne Murcott. Introducing the Sociology of Food & Eating. Bloomsbury Academic, 2019. An interesting approach by a well-qualified and experienced author. The book takes on controversial issues of great interest to students using an entertaining writing style. 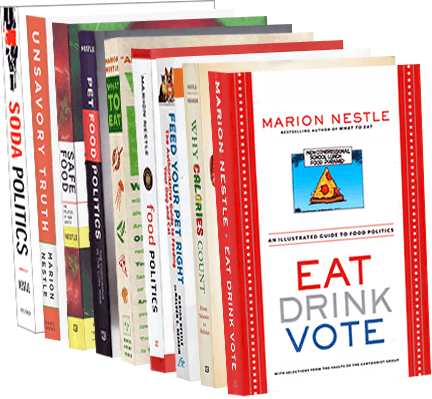 This is a textbook that aims to teach critical thinking about current food issues. By “interesting approach” I was referring to the way Murcott structures the chapters. The chapter titles state some common idea about food—for example, “The family meal is in decline.” The chapters examine what the issue is about, describe the methodological and other biases that led to such conclusions, and then go on to explain how sociologists think—theoretically and practically—about each issue, and how they approach studying such issues. This works well for that purpose. Nico Slate. 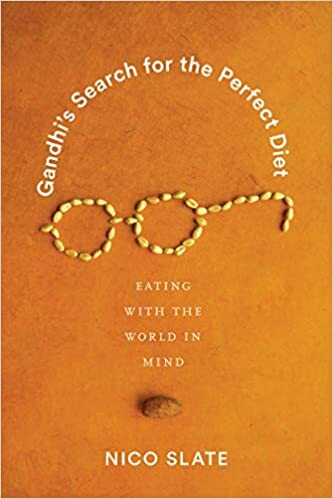 Gandhi’s Search for the Perfect Diet: Eating with the World in Mind. University of Washington Press, 2019. Nico Slate’s fascinating account reveals Gandhi as an evidence-based, self-experimenting nutrition guru who tried one diet after another—vegan, raw, calorie restriction–in his quest for physical and spiritual health. Above all, Slate explains Gandhi’s use of fasting as a political means to inspire India to achieve independence. The book explains how Gandhi’s dietary choices were tightly linked to his politics. Kevin D. Walker. The Grand Food Bargain and the Mindless Drive for More. Island Press, 2019. Early farm bills, sold to the public by promising more food with less uncertainty, were designed to stabilize food prices and increase farm income. Eight decades later, new farm bills are still being enacted despite average farm income long ago surpassing non-farm income and continuing food surplus. Each new bill is an increasingly costly grab bag of subsidies and protections, which invariably attracts more interest groups and lobbying. Other than loose connections to agriculture, no coherent policy direction exists (p. 91). Narrow [scientific and technical] expertise alone, for example, does not address the connections among rising rates of obesity, exhaustion of fossil waters, escalating nitrous oxide in the atmosphere, noxious weeds immune to legacy pesticides, growing antibiotic resistance—all the result of how the modern food system operates and how society now lives (p. 114). As sophisticated financial strategies are grafted onto the modern food system, more mergers and acquisitions by ever-larger multinational companies follow. Food is no longer valued for its ability to sustain life, but only for its ability to generate profits. Whether higher returns come from squeezing farmers under contract to grow pigs or poultry, creating a monopoly on seeds that can be doused with chemicals, or selling food laden with cheap calories makes no difference (p. 141). Walker’s remedy? Let food be our teacher. It’s worth reading what he means by this. Jonathan Marks. The Perils of Partnership: Industry Influence, Institutional Integrity, and Public Health. Oxford University Press, 2019. Jonathan Marks is the go-to expert on the hazards of public-private partnerships. His account of the perils reads easily, is well referenced, is clear and to the point, and applies to partnerships with drug, food, and any other corporations. Anyone who cares about the ethical implications of such partnerships for public health will find this book invaluable. The book is about industry partnerships in general, but Marks uses food-company examples such as the American Beverage Association’s gift to the Children’s Hospital of Pennsylvania in what seemed to be a direct exchange for the city’s dropping a soda tax initiative, and the USDA’s promotion of cheese. Public-private partnerships, multistakeholder initiatives, and other close relations with industry are premised on a positive conception of consensus, compromise, and collaboration. But the “three C’s” are not inherently good. On the contrary, tension between regulators and corporations is ordinarily necessary to protect public health. And achieving common ground with industry may put off the table measures that might promote public health. The default relation between industry and government should be arm’s lengths relations involving institutional tension, “struggle,” and direct conflict. The point: the agenda of corporations is to promote profit, not public health. This creates an inherent tension, not easily resolved. Daniel Imhoff with Christina Badaracco. The Farm Bill: A Citizen’s Guide. Island Press, 2019. In 2011, I had the bright idea of teaching a graduate course on the farm bill to food studies students at New York University. As happens every four years or so, the bill was coming up for renewal and I thought it would be useful for the students–and me–to take a deep dive into what it was about. I knew help was available. Dan Imhoff had laid out the issues with great clarity in his first book about this bill in 2007. I used it as a text. I wrote about this experience in “The farm bill drove me insane” (Politico, March 17, 2016), which it most definitely did. The farm bill is huge, encompassing more than a hundred programs, each with its own acronym and set of interested lobbyists. The bill is unreadable, consisting mainly of amendments to previous bills; it is comprehensible only to lobbyists, a precious few congressional staffers, and occasional brave souls like Imhoff willing to take it on. It costs taxpayers close to $100 billion a year; most weirdly, 80 percent of this money covers the costs of the Supplemental Nutrition Assistance Program (SNAP, formerly food stamps) which is stuck in the farm bill for reasons of politics. The farm bill represents pork-barrel, log-rolling politics at its worst. Imhoff explains the bill as a fully rigged system gamed by Big Agriculture in collusion with government. The public pays for this system thrice over: at the checkout counter, in subsidized insurance premiums, and for cleaning up the damage it causes to health and the environment. Despite these scandalous costs, the mere mention of the words “farm bill” makes eyes glaze over. Why? This is a forest-versus-trees problem. The bill—the forest–is far too big and complicated to grasp. We try to understand it by looking at the programs–the trees–one by one. Hence: insanity. Imhoff’s approach to the forest is to focus on the overriding issues that farm bills ought to address. A rational agricultural policy should promote an adequate food supply while protecting farmers against uncertain climate and price fluctuations. It should promote the health of people and the environment and do so sustainably. And it should provide incentives for people to farm and ensure a decent living for everyone involved. But instead the farm bills encourage an industrial agricultural system incentivized to overproduce corn and soybeans to feed animals and to make ethanol for automobiles, to the great detriment of public health and environmental protection. Nowhere are these problems more obvious than in the debates about the 2018 farm bill. As I write this, the House is working on a bill that seems less protective of health and the environment than any previous version. To cut costs while maintaining support of Big Agriculture, the House aims to reduce SNAP enrollments, eliminate conservation requirements, and cut out even small programs that support small farmers or promote production of fruits and vegetables—“specialty crops” in USDA parlance. At this moment, the outcome of the 2018 bill is uncertain, but The Farm Bill: A Citizen’s Guide has a more generic purpose—to introduce readers to the big-picture issues. Imhoff relates the history of farm bills, their origins and subsequent growth. Imhoff describes the system: how Big Agriculture works, how food stamps ended up in the bill, what all of this means for farming and food assistance, and what kind of legislation is needed to promote a healthier food system. We should, Imhoff insists, rework the farm bill to promote public health by supporting an agricultural system that grows food for people rather than animals and cars. We should legislate that crops be grown sustainably so as to reduce agriculture’s contribution to greenhouse gas emissions, soil losses, and water pollution. Imhoff suggests twenty-five solutions to current agricultural problems. These should be required reading for anyone who cares about what we eat, today and in the future. It is too late to fix the 2018 farm bill, but there is plenty of time and opportunity to make the next one a true citizens’ farm bill. To quote Imhoff: “it’s time to question whether the industrial mega-farm model is the only way to feed a growing global population, or whether it’s even possible for such a system to survive without costly government supports and unsustainable environmental practices.” His book should inspire better, smarter solutions. Get busy. Febe Armanios and Boğaç Ergene. Halal Food: A History. Oxford University Press, 2018. I reviewed a book about the regulation of Halal Food in September last year, and its politics continue to fascinate me. This book covers anything and everything you would want to know: the rules, the slaughter issues, what the rules say about alcohol, and how delicious Halal food can be and is. Its has great illustrations (alas, in black-and-white) and the Appendix comparing Kosher, Christian, and Halal food rules is a model of clarity. Beyond street or fast food, halal eating in France has also transformed into a gourmet style dubbed “French-halal fusion” or “haute halal.” Some young Muslims born and raised in France grew up unable–bit yearning–to taste some of France’s most iconic dishes, like foie gras and magret de canard, and several of them have long blogged about these frustrating barriers. The barriers began to fall in 2007, when two brothers of Algerian origin…opened Paris’s (and possibly that country’s) first gourmet French -halal fusion restaurant, Les Enfants Terribles….The restaurant, moreover, serves no wine or alcohol, which the owners admitted was a “turnoff” for some French customers. Responding to this drive to make halal food more chic, gourmet, and even decadent, in 2015 the first halal cooking school, “L’Ecole de Cuisine Halal, opened in Paris. This book is fun to read, and has much to teach.